LEXINGTON, Ky. (Oct. 5, 2017) — University of Kentucky students, faculty and staff now have access to a specially equipped lactation space. The lactation room — on the second floor of Erikson Hall — provides a relaxing, private space designated for breastfeeding mothers. The idea of the new lactation room came to fruition through the hard work and dedication of the UK School of Human Environmental Sciences (HES) and the school's director Ann Vail. HES, part of the UK College of Agriculture, Food and Environment, recently hosted an open house for the new room, during which members of the UK community visited the room and admired its welcoming environment. The school’s staff — along with family and consumer sciences extension agents from across the state — were invited to send photos of their infants and toddlers to create the wall décor for this new space. 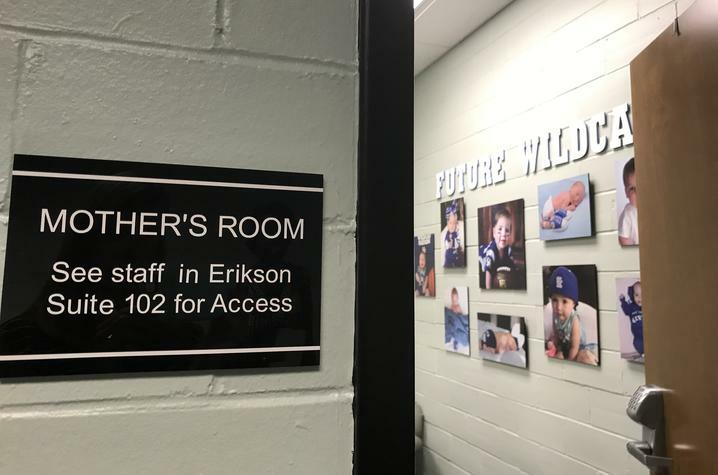 Any member of the UK community — faculty, staff and students — can gain access to the lactation room through the HES main office in 102 Erikson Hall. Additional information is available by calling 859-257-3887. For more information about lactation in the workplace and a list of dedicated lactation spaces on and off campus, visit UK Human Resource’s Work-Life website.